It’s not too far to Farrar! Based on collective memories, a stay at Eggers and Company General Store B & B is reminiscent of visiting grandparents in the country. After a pleasant drive through the beautiful countryside of eastern Perry County, the story of rural America in the mid 1900’s unfolds as you step across the threshold. The General Store with house attached is listed in the National Register of Historic Places and has been lovingly restored by owners Ellen and Steve Frye. 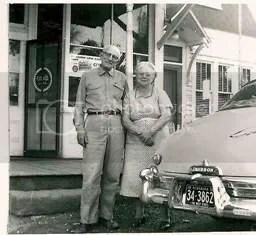 Ellen’s grandfather, Martin “Tom” Eggers and his brother Walt were the store owners from 1920 through 1966. Many original artifacts remain in tribute to the Eggers family, the town of Farrar and rural America in those decades. Breakfast offerings from Ella’s kitchen serving in-season locally grown food. Come be our company at Eggers and Company! Comments Off on It’s not too far to Farrar!